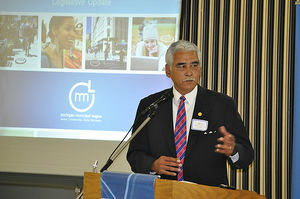 John Espinoza (born 1950 in Texas) is a State Representative representing the 83rd District of Michigan. Teaching Certification, Saginaw Valley State University. Former Military Affairs/Community Outreach Liaison, Former Congressman Jim Barcia. Former Member, Sanilac County Board of Commissioners. Veteran of Foreign Wars, Lexington. In 2004 DSA targeted local races where control of state houses were up for grabs and where statewide electoral-vote outcomes hinged on successful local district turnouts. Detroit DSAers isolated two state legislative races where they can make a difference in swing districts of this toss-up state. In the Detroit suburbs of Farmington/ Farmington Hills (SD 37) labor backed Democratic incumbent Aldo Vagnozzi holds his seat thanks to a 2002 upset...In Port Huron/Lexington (SD 83) former migrant farm worker John Espinoza, who opposes school vouchers, is making living wage and health care features of his campaign. Thanks to Farm Workers leader Dolores Huerta for connecting DSA with the candidate, who is well-liked but is running a poorly financed operation. That may not matter, as his Republican opponent is caught in a scandal over use of nonprofit funds for campaign purposes. Michigan is a success story. Both state senate candidates, the long-shot insurgent former farmworker John Espinoza and the labor-backed but Republican-targeted incumbent Aldo Vagnozzi won. Democratic socialists in southeastern Michigan possess a level of influence within the Michigan Democratic Party of which many American leftists dream. And "they’ve done it all without compromising their beliefs or values". Since 1998, Detroit DSA, with about 250 members, has successfully partnered with local county chairs and other Democratic Party officials to promote and elect several progressive candidates to the Michigan state legislature. One of these candidates, State Rep. John Espinoza, was even elected in the heavily conservative “Thumb” region of the state. In 2004, with the backing of Detroit DSA, Espinoza became the first Democrat and the first Latino ever elected to represent Michigan’s 83rd District. As at Feb. 1, 2011, State Rep. John Espinoza, Pt. Huron/Croswell was listed as an endorser and ongoing supporter of MichUHCAN's Health Care Security Campaign Coalition. The Michigan Universal Health Care Access Network is a state-wide network that promotes comprehensive health care for all and improved health outcomes by addressing the social determinants of health through education, strategy development and advocacy. The leadership of MichUHCAN is heavily dominated by members of Democratic Socialists of America. This page was last modified on 8 October 2011, at 21:41.